More than just a slogan, the JEC Lower School’s #Proud2beJEC mantra was enthusiastically reflected last week when the division held a pep rally as part of their roster of special activities over the month of Adar. With students and faculty alike dressed in the lower school’s signature blue and yellow, the morning commenced with a gathering of all grades, presided over by lower school Principal Rabbi Uzi Beer, who was decked out in full color attire, including a bright yellow bandana on his head. The sixth grade girls taught everyone a brand new school handshake and the fifth grade boys performed a song about JEC pride. 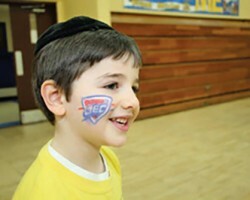 While almost every student was dressed in school colors, some took it a step further and even had logos drawn on their cheeks, while others wore JEC t-shirts or carried signs and other pro-JEC paraphernalia. It was an all-out celebration of the school and each other and Rabbi Beer’s vast camp experience was apparent as he drummed up enthusiasm and excitement with each cheer and routine. “Who are we?” he challenged students and staff. “JEC!” they responded fervently. “Proud to Be!” he continued with a boisterous bellow. “JEC!” they gleefully roared back.